Sadeq Saba's recent documentary "The Genius of Omar Khayyam" was awkward to watch at times but saved only by a subject matter that is interesting because of its own virtues. Saba seemed more like an inexperienced rider, unable to rein in a vigorous and lively stallion, but thinking that its virtues somehow rub off on him. There is no doubting his genuine interest and enthusiasm for the subject, but one is left wondering half an hour into his documentary whether his overall aim was simply to glorify Persian cultural achievements at the expense of Iran's Muslim identity. In one scene, where he discusses Khayyam's poetry with a publisher, the familiar face of Iran's former Shah peers out seditously from the wall behind him. The parts of the documentary focusing on Omar Khayyam's mathematical and astronomical works were absolutely fascinating, but again Saba seems bewildered and the topic simply flies past his head. Another reason he may not have found this as interesting is the murky dividing line between his clean cut "Persian" civilization and the Islamic/Persian/Arab cosmopolitanism that Khayyam actually lived within. These are profound philosophical ideas rooted in an Islamic philosophical perspective. The references to the door for which no key to be found tell us that there are things we cannot touch upon with anything that we have, the veil past which he could not see is death. In the Qur'an, the *veil* is removed on the day of judgement so that mankind can finally see. The futility of trying to push past this veil, of opening the door, is of a philosopher trying to make out what becomes of him, his thoughts, his person, once he dies. Other Islamic philosophers wondered about this such as Avicenna or Averroes. Averroes had a complicated idea of a group mind, a group consciousness that is the sum collective of the knowledge that humanity has accumulated. A bizarre precursor to the Hegelian Geist or Universal Mind, "some little talk a while of me and thee, There seem'd - and then no more of Thee and Me". It is as if Khayyam is entertaining ideas of his self being absorbed into something greater perhaps, or at least that the religious message of the prophets of destroying the ego can be attained beyond that forbidding door with no key. This is a continuation of his earlier theme mentioned in the Rubaiyat, of being "with Yesterday's Seven Thousand Years" (part 20). Saba does not comprehend that Khayyam is not being anti-religious or nihilistic when he proclaims "Drink! - for once dead you never shall return" in section 34. Again, Khayyam is drawing deep from the well of Islamic mysticism, that those who die in this world shall never return to it. But his constant reference to wine puzzles Saba, and even the answer given to him by one of the interviewees does little to dent his own one dimensional view of Khayyam as a womanizing drinker. 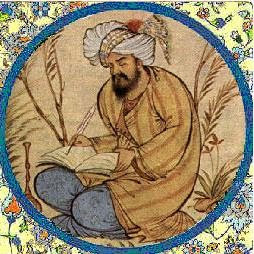 Wine is always mentioned in Sufi and mystical Islamic poetry as expressive of a present, or of an ecstasy and joy in a moment. That in reaching our beloved, in attaining paradise, the muslim to Allah experiences the ecstasy of being close to the Divine. The Qur'an speaks of rivers of wine for those who reach paradise, the Prophet himself was offered a choice between wine and milk. Wine is not that radical a subject matter for poets who are Muslims or writing in a Muslim context, its prohibition notwithstanding. Ultimately this documentary tells us more about Saba's own opinion on current geopolitical events and religion than it does about who Omar Khayyam the man really was. In doing this he has made a poor documentary of only limited benefit and one which will be, as expected, celebrated by the Middle East's many pseudo-intellectuals and rebels without a clue. Those people, to quote from the Qur'an, "who do not know". You can watch the programme on BBC iPlayer within the UK for another few days before it is taken offline. Your blog is well structured and have good selected contents. I liked it. Thank you for stopping by and for your comments. I am glad you like it.